If you use Gmail's POP3 fetching feature to read messages from other email accounts, you've noticed that Gmail checks for new messages less frequently than desktop mail clients. Usually, Gmail tries to find new messages every hour, but some accounts are updated more frequently, especially if you get many messages. "Once you've set up Mail Fetcher, Google will check your other accounts on a regular basis, and new mail will appear automatically in Gmail. Gmail checks individual accounts for new messages at different rates, depending on previous mail fetch attempts. At this time you can't customize the frequency of automatic mail fetches," explains Google. While the most obvious improvement would be to manually set the frequency, Google decided that's inefficient, but added a Gmail Labs feature that lets you manually refresh your accounts. Go to Gmail Labs, enable "Refresh POP accounts" and click "Save Changes". When you want to check for new messages, click on the "Refresh" link at the top of the page. You should see a message informing you that Gmail is "fetching mail". Until now, you had to go to the Settings page, select the Accounts tab and click on "Check mail now" next to each POP3 account. Gmail solved this problem by adding a new feature to the existing "Refresh" link. "The refresh link at the top of your inbox will not only update your inbox with your new Gmail messages, it will also fetch messages from any other accounts which you have set up," mentions Emmanuel Pellereau. 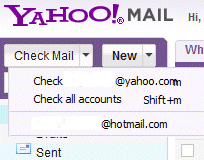 Yahoo Mail has a better mail checking interface: you can refresh individual POP3 accounts with just two clicks and there's a keyboard shortcut for refreshing all accounts. Unfortunately, Yahoo Mail checks your POP mail accounts for new messages only when you request it. Update: The Labs feature has graduated in August 2012 and it's a standard Gmail feature. Click the refresh button at the top of your inbox. Nice they finally added this. I used to use the pop feature on my gmail account, but stopped using it because this feature didn't exist. I now have all my mail setup so I don't need to use pop and it all goes into gmail. Atleast now If I run into the situation where I need to use pop again, I can. Good feature. Also thanks for the tip themis, very clever. If you have greasemonkey there is a script that will auto-check your mail every 8 minutes. Far more useful than a silly button imo. POP3: Checked too recently. Try again later. What is the timeout for this then? I assume it's about one minute. @mirko If you do a full refresh your inbox completely (hold Shift while hitting your browser's refresh button) you can click the POP3 labs refresh button again. You can do it every 10sec or so this way. If you do a full refresh your inbox completely (hold Shift while hitting your browser's refresh button) you can click the POP3 labs refresh button again. You can do it every 10sec or so this way. Its very frustating that google has eliminated this option, and its back to " have to go to the Settings page, select the Accounts tab and click on "Check mail now" next to each POP3 account"